Get familiar with wedding limousine services. Your wedding is one of the most important events of your life. We know how important it is for every detail to be right in place – from the dress to the catering service to the colors of the flower bouquets to the wedding transportation. After months of stress, planning and hundreds of phone calls, you deserve the absolute best on your wedding day and Naperville Limousine is at your service. Whether you just need to get to church on time or get all your friends and family to the wedding reception together – we have got you covered. With a wide variety of wedding carriages to choose from, we will help you choose the perfect wedding limousine to satisfy your budget, taste and needs. With our wedding limousine packages, not only will you be picked up and dropped off to your desired locations on time and in style, but you will also have the most elegant, comfortable, safe and worry-free experience. For over two decades, Naperville Limousine has been providing luxurious wedding transportation services so you can trust us to make your big day truly magical! With professional drivers, top-quality service, impeccable vehicles, special wedding decorations, luxurious interior, drinks, comfortable seats, red carpet treatment and an on-time service, you will be able to leave all your wedding day worries at home and enjoy the most of this important day in your life. How much is limo service for a wedding? Prices range from $162 to $960 for a 3 hour service. It depends on the carriage and the day of the week you choose. 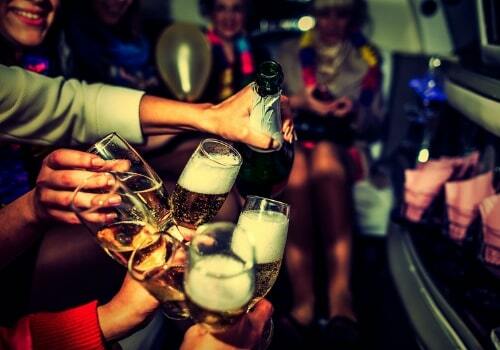 We have a wide fleet including everything from luxury sedans to huge party buses. So you are sure to find something that will fit your budget and taste. You can choose from our Lincoln MKT (3 passengers, reclining leather seats, USB ports), Hyundai Equus (3 passengers, entertainment system, heated & ventilated rear seats), GMC Yukon (6 passengers, leather interior, audio system), Lincoln MKT Stretch (8 passengers, leather seats, bar, flat screens, audio system, club lighting), Hummer H2 Stretch (16 passengers, bar, music center, flat screen, club lighting), Infiniti Stretch (18 passengers, bar, music center, flat screen, club lighting), Mercedes-Benz Sprinter Shuttle (14 passengers, sound system with flat screen, private glass with blinds, mood lights, luggage compartment), Mercedes-Benz Sprinter Limousine (12 passengers, sound system with flat screen, private glass with blinds, mood lights, bar), a 22-passenger party bus (dance floor, high-end music system, club lighting, bar) and a 30-passenger party bus (dance floor, pole,, high-end music system, club lighting, bar). The prices on Saturdays are slightly higher, while Sunday through Friday they are lower. All of our wedding service packages are a minimum of either 3 hours or 4 hours long with an extra charge for every extra hour. As there is a variety of vehicles to choose from, the prices vary, starting from $162 for a 3 hours service with a sedan and reaching up to $960 for a 3 hour service with a party bus. For exact prices of our wedding service packages click here [https://www.napervillelimousine.com/limo-service-chicago/weddings/]. Celebrate the special day with your friends and family! Who goes in the limo at a wedding? That is completely up to you! It could be just the bride and groom, or the parents, or even the guests as well. We have wedding carriages that could seat up to 30 passengers. So whether you need a wedding limo service just for the bride and groom or for all of their friends as well – we will help you choose the perfect vehicle and get you to the ceremony in style and on time. Do you need a limo for a wedding? Well, let us put it this way – you deserve the best on your wedding day. We’re sure wedding day stress is overwhelming you enough, so let us provide you with a stress-free and top-quality wedding limousine service on the most important day of your life! Expect professional chauffeurs, comfortable seats, luxurious interior, a “Just Married” sign, champagne, beer, soft drinks, all kinds of decorations, and even red carpet treatment! We will take care of all of the details. With our service, you will feel like all your stress is left at home. All you will have to do is sit back, relax, stretch your legs, and give your beautiful wedding gown the room that it deserves! 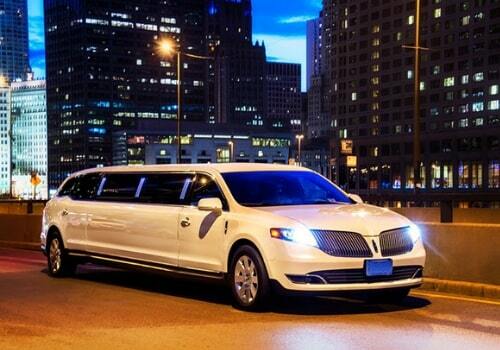 Before you know it, you will arrive at your desired location with elegance and sophistication. With our wedding limousine service, your special day will be even more special. There is simply no better way to arrange your wedding transportation! So wait no longer, book your wedding carriage today and have one less task to worry about before your wedding day. You can book your wedding transportation service by clicking here or calling us at 630-778-5959.